I recently gave up dairy and discovered coconut milk as my go-to alternative. I’ve been surprised how versatile this ingredient is. This is one of my favorite alternatives because I don’t feel I’m compromising taste or texture in any of my recipes and unlike coconut oil, it does not taste like coconut. I use it in my coffee in the morning. Not only does it have less calories than milk or cream, it is only has 50 calories per 1/3 cup serving. If you’re wondering if your coffee is going to taste like coconut, let me assure you that it doesn’t. I use Native Forest coconut milk which is organic and their cans are BPA free. I also use So Delicious Culinary Coconut Milk in cartons. The great thing about either of these is that you can store them in your pantry until you’re ready to use them. In a recent hotel stay, I had gone to the store to buy Lite Coconut Milk for my morning coffee. I had stopped by the hotel restaurant to get an iced coffee. They happen to add dairy to their coffees, so I gave the girl my coconut milk as a replacement. All I can say is you’ve got to try it. She added vanilla and caramel sugar-free syrup (At home I use a mixture of 1/2 tsp vanilla, 1 part water and 1 part honey as a simple syrup) to the bottom of the cup, then ice, 1/3 cup of the coconut milk, and about 1/4 cup of very strong coffee. It was just as creamy and delicious as if she used cream. I’m actually surprised that it hasn’t caught on yet at restaurants. I see soy or almond milk, but not coconut milk. You can use coconut milk to make yogurt, Greek yogurt and use them in your smoothies. NOTE: I use 2 probiotics instead of yogurt starter. I’ve used coconut milk in my curries, soups and potatoes. You can even make ice cream in your ice cream maker with it. Just add pulverized bananas to sweeten it up (no sugar required) and a little vanilla. Pretty much anywhere you use milk or cream you can add coconut milk. Lite Coconut Milk – Less heavier than regular coconut milk, but just as creamy. Coconut Cream – A thicker version of coconut milk. Use as a cream replacement or use to make whipped cream (just store in the frig until ready to use). I hope you give it a try. Drop me a line and let me know how you like it. Wondering what to do with your aging bananas? Freeze them! Not able to finish all your strawberries? Freeze them. They make fabulous smoothies! I even buy ripe pineapples on sale. Cut them up and freeze them. You can make all kinds of things out of frozen fruit. Hate stevia? I used to, but have learned by experimenting and found better ways to use it. I love it now. Because it’s 300 times sweeter than sugar, the key is adding a little, then tasting and making adjustments. Don’t use Stevia in the raw, it contains maltodextrin and is associated with MSG. Pyure organic stevia is one one of the only organic stevias out there. Ditch the so-called “natural” sweeteners and avoid the GMO pesticide ridden products. Want to eat whole foods? Choose an organic full-fat Greek yogurt with no fillers. Unfortunately, the process used to reduce fat in milk products does not make them whole foods. Better yet, make your own! It’s easy and you can even use your oven. Just make sure you use a yogurt (not Greek) with live cultures as your starter. Makes 2 large glasses of smoothies. I just love it when an ingredient gets replaced and comes pretty close to the original recipe. I took a childhood recipe for fried rice and replaced rice with riced cauliflower. We were going to try this last night in my Gluten-Free workshop, but were just too full from consuming the two delicious cauliflower pizzas. This is what we had for lunch today. It was all ready to go, so I just fried it up and served it. Instead of meat, I used mushrooms. Heat 1 Tbs of oil in a wok. Pour in eggs and stir fry quickly until eggs are in pieces and remove from wok. Heat the another Tbs of oil and stir fry meat about 7-10 minutes. Add peas and fry 1 minute. Remove from wok. Heat the last Tbs of oil. 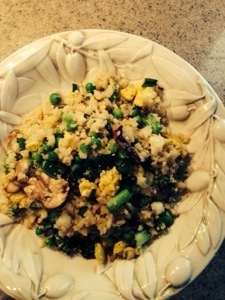 Fry green onions and the cauliflower rice. Mix well, add soy sauce and salt. Reduce heat and stir until rice is thoroughly heated. Add remaining ingredients and mix well. I guess I’m on a fish kick, but I just didn’t want to miss telling you about this delicious salmon. After enjoying it in many SOCAL (Southern California) restaurants, I decided to go home and make my own. It has been a big success with friends and family. NOTE: Use wild caught salmon. Farm raised salmon are fed soy and dyes (to get their red color). In a small bowl, combine miso, sesame oil, Bragg Liquid Aminos. Coat the top and bottom of the salmon with the miso mixture. Sprinkle sesame seeds on the top and bottom of fish. Grill fish. Fish is especially delicious if you grill it on a cedar plank pre-soaked in water. If you live in Lawrence County, Tennessee, you can find white miso paste in the refrigerator section of Oriental Pearl in Florence, Alabama. Whole Foods or Earth Fare also carry it. If you can only find red miso paste, it’ll work just as well. Earth Fare carries organic white miso. Here’s a healthy alternative to breaded fish. Nuts replace the bread crumbs. It tastes great on salmon, tilapia, orange roughy or halibut. My favorite is macadamia nut crusted salmon and almond crusted tilapia. Believe me, you won’t miss the bread! Besides, it’s been reported that people who eat a handful of mixed nuts on a daily basis are 20% less likely to die from heart diseases, cancer or other ailments. Read 7 Nuts That Help You Live Longer written by the Huffington Post. Grind nuts, basil, parsley, parmesan, salt and pepper in a food processor. Place in a shallow dish. 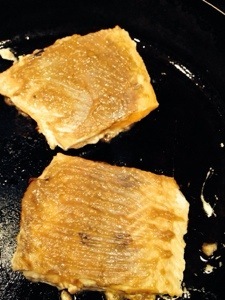 Coat each piece of fish with the crust mixture. Pack it on. Set aside. Heat a frying pan on medium-high heat with olive oil. Make sure pan is hot before adding fish. Cook fish about 3 minutes until brown, then flip it over and cook 2-3 minutes. 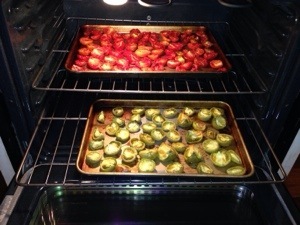 If fish is thick, place in a baking dish and finish off in a 350 degree oven for 15 minutes. 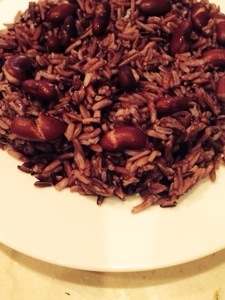 Enjoy this delicious dish with my Asian red beans and rice.